Imagine this: biking along with your young child perched safely between your arms. You sing a song, talk about the clouds in the sky, and practice counting to 10. Soon you’ve reached a hill and now you’re breathing too hard to talk, but your kiddo is happily ringing the bell on your handlebars and urging you on. 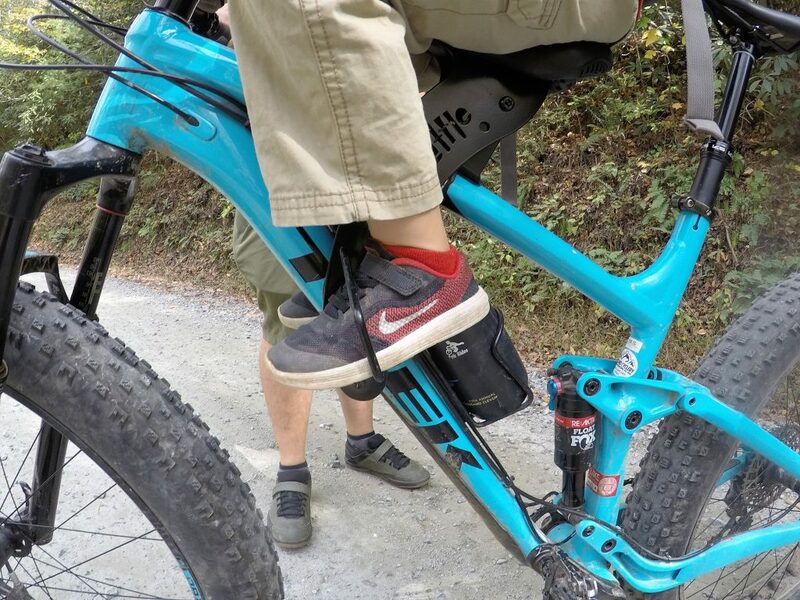 This is what a family bike ride is like with a front-mounted bike seat. Maybe you already know what this is like; maybe you’ve been using an iBert or Yepp Mini since your tyke was tiny, but now they’ve outgrown it. Fortunately, you don’t have to give up your bike seat days just yet. There are now several front-mounted bike seats on the market that allow you to bike with kids in the 2-5 age range. And one of the best is the Do Little Bike Seat. The Do Little is a fantastic little seat out of New Zealand, where evidently, they know how to do family cycling the right way. 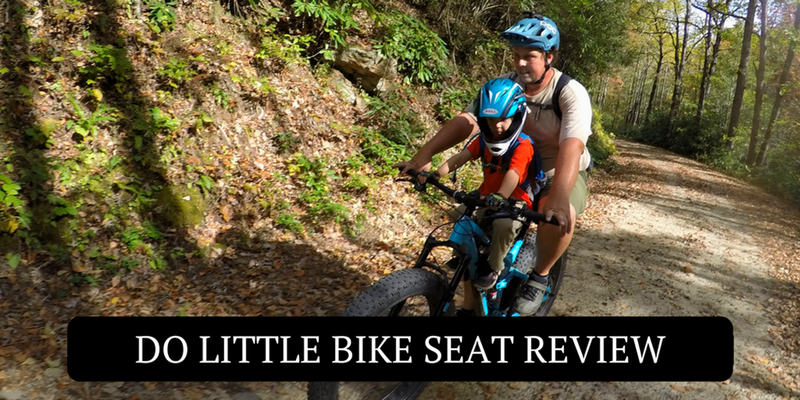 The Do Little bike seat performs well on pavement, dirt roads, and yes, even singletrack. The seat looks like a normal bike saddle and is comfortable for children even on long rides. Your little one is able to reach the handlebars, which is both fun and add to their stability. Their feet are able to rest on “stirrup” type foot pegs that help keep them out of the front wheel. (See my review of the TykeToter to see the issue we’ve had with open foot pegs). Like any front-mounted seat, the position of the child does cause the adult rider to ride ever so slight bow-legged. We’ve found we don’t mind it at all on shorter rides, but on outings longer than 5 miles it can start to become a little uncomfortable. Other than that, the position of the child on the Do Little is comfortable and manageable for the parent. Installation of the Do Little is straightforward and simple. The seat installs to the top tube of the adult’s frame with a few bolts. 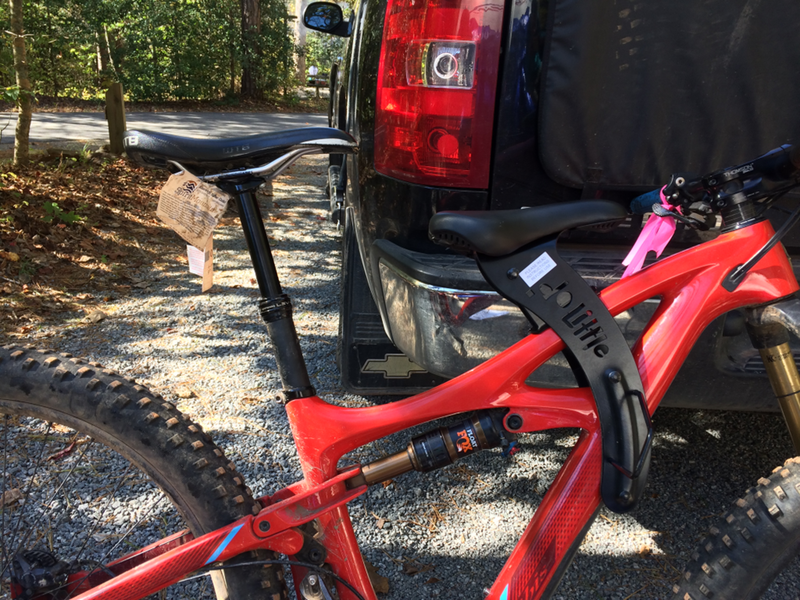 We like this setup because it allows you to adjust the position of your child on the bike, and because it doesn’t mount to the seatpost (like some other front mounted seats) you can use it with a carbon or dropper post. It also allows the seat to mount to just about any bicycle and doesn’t cause the compatibility issues that many seats have. It is suitable for use on cruiser bikes, road bikes, and even full-suspension mountain bikes. (The latter is what we’ve been using it on). That said, there are a few things we don’t like about the installation. It takes a few minutes to install / uninstall which means once you’ve put it on your bicycle you probably don’t want to take it on and off very often. Secondly, there is the potential to scratch and/or damage your frame. I didn’t spend to much time worrying about this, but might think twice before I installed it to an expensive carbon frame. The most important measure of a bike, in our opinion, is how much fun it is for parent and child. If the child is having fun, but the parent is uncomfortable or working too hard, then you won’t get out very often. If the setup works well for the adult but the child is bored or uncomfortable, they’ll learn to associate biking with unpleasant emotions. Fortunately, the Do Little bike seat is enjoyable for all. Child and adult are free to chat and interact as they bike, making boredom impossible and offering a bonding experience. The Do Little fits a wide age range which makes the seat a good investment if you’re buying it for a toddler. Do Little markets the seat as appropriate for ages 18 months to 7 years, but I would argue that it is probably best suited for kids 2.5 years to 6 years old. Kids need to have the good sense to hold onto the handlebars and keep their feet in the stirrups before introducing them to an open seat like this. On the other end of the spectrum, your child is likely to get to tall to use the Do Little before they are 7, BUT if you have a particularly small child it is possible. My small 5 year old fits comfortably on the seat with some room yet to grow. Compared to nearly any alternative, the Do Little is incredibly lightweight. Trailers and trailer-cycles, in particular are heavy. 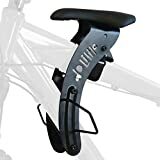 Even compared to a good rear-mounted bike seat like the Yepp Maxi, you’ll find that the Do Little saves you some weight. This is nice because kids are already heavy to haul, you don’t want to add a lot of additional weight in the process. The Do Little bike seat costs $160 NZD. As of the writing of this review, that converts to about $110 USD. That’s on par with other bike seats and much cheaper than a high-quality bicycle trailer or trailer-cycle. Considering that the seat is durable and can be used for several years before being outgrown, the Do Little is a smart buy. In case the seat itself wasn’t nice enough, it also comes with a few thoughtful extras that we appreciated such as a carrying bag. Since the seat has several small parts (such as bolts) it is nice to have somewhere to store everything securely together when not in use. It also comes with a few extra bolts in case you were to lose one, and rubber shims to help as a work-around in case you have external cable housing on your top tube where the seat mounts. Not sure the Do Little is the best choice for your family? Here’s how it stacks up against it’s closest competitors. 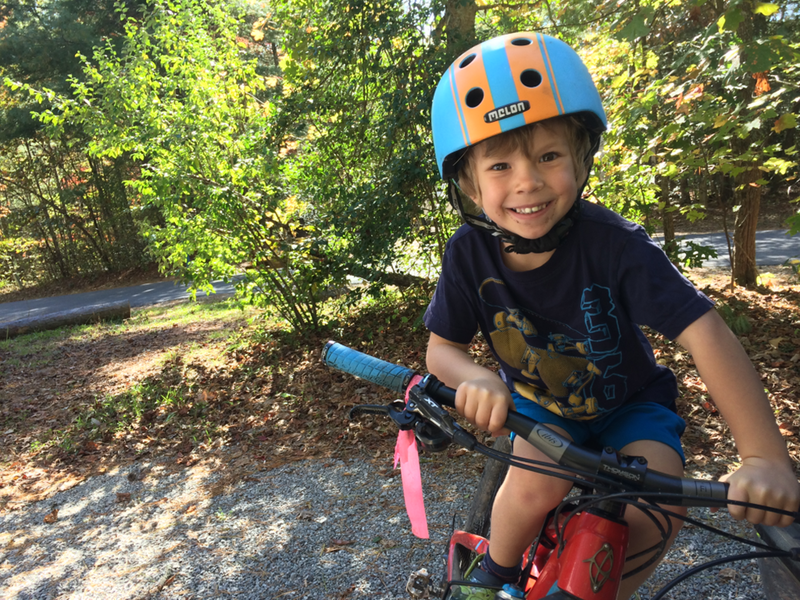 If you love front-mounted child seats, but your kiddo has outgrown their iBert or similar similar seat, then the Do Little Bike seat is the logical next step. It is safer than the TykeToter (in my opinion) and more affordable than the Mac Ride. Most importantly, it’s FUN. Any chance you have a Do Little seat you want to sell? I am just getting into the open seat rider biking and the price, while better than a lot other out there, is still a little on the higher end than I wanted to spend. Since you all look like you may have outgrown yours, I would love to help take it off your hands! Hi Tiffany, I’m afraid not! But, you could try joining and posting in our biking with kids facebook group (https://www.facebook.com/groups/biking.with.kids/). It’s possible someone there might have one or something similar to sell. Good luck!